Dimensions 1.25 by 6 by 9.25 in. Conception assistâee par ordinateur en gâenie logiciel; Congráes. Conception assistGee par ordinateur en gGenie logiciel; Congráes. Conception assistee par ordinateur en genie logiciel; Congr es. 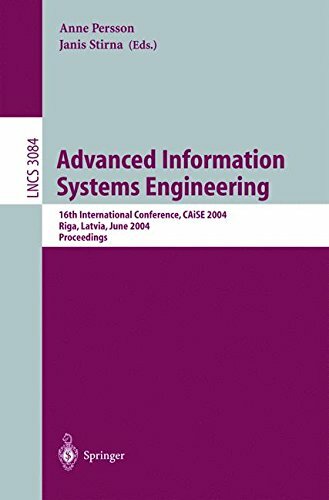 Amazon.com description: Product Description: th CAiSE 2004 was the 16 in the series of International Conferences on Advanced Information Systems Engineering. In the year 2004 the conference was hosted by the Faculty of Computer Science and Information Technology, Riga Technical University, Latvia. Since the late 1980s, the CAiSE conferences have provided a forum for the presentation and exchange of research results and practical experiences within the ?eld of Information Systems Engineering. The conference theme of CAiSE 2004 was Knowledge and Model Driven Information Systems Engineering for Networked Organizations. Modern businesses and IT systems are facing an ever more complex en- ronment characterized by openness, variety, and change. Organizations are - coming less self-su?cient and increasingly dependent on business partners and other actors. These trends call for openness of business as well as IT systems, i.e. the ability to connect and interoperate with other systems. Furthermore, organizations are experiencing ever more variety in their business, in all c- ceivable dimensions. The di?erent competencies required by the workforce are multiplying. In the same way, the variety in technology is overwhelming with a multitude of languages, platforms, devices, standards, and products. Moreover, organizations need to manage an environment that is constantly changing and where lead times, product life cycles, and partner relationships are shortening. ThedemandofhavingtoconstantlyadaptITtochangingtechnologiesandbu- ness practices has resulted in the birth of new ideas which may have a profound impact on the information systems engineering practices in future years, such as autonomic computing, component and services marketplaces and dynamically generated software. About: th CAiSE 2004 was the 16 in the series of International Conferences on Advanced Information Systems Engineering.